If you want to be a Delegate to the Democratic Conventions (Congressional District, State, National), you will have to run for that. Run at the local level in (a caucus), then move up to the Congressional District (convention), attend the State Convention in Richmond on June 18, then if elected, you will then go to the DNC Convention in Philly on July 25-28. About Virginia Caucuses and Conventions, via DPVA. On either April 16 or 18, 2016, cities and counties across the Commonwealth will hold caucuses that will elect 2,000 State Delegates and 500 Alternates. These Delegates and Alternates will attend the Congressional District Conventions and a State Convention. The State Delegates will be allocated among the Democratic Candidates in proportion to the percentage of their vote in the primary. The State Delegates will then elect the National Delegates. Any registered voter may participate. The voter, however, must sign a certification that he or she is a registered voter in the jurisdiction, is a Democrat, believes in the principles of the Democratic Party, and does not intend to support a candidate opposed to the Democratic nominee in the next election. It sounds complicated, but it is not. 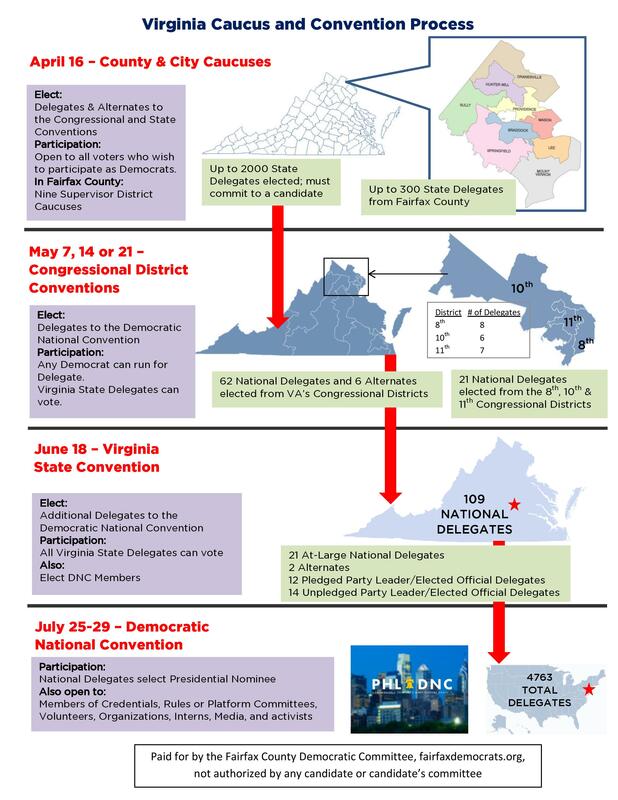 Thanks to our friends at Fairfax Democrats, here is an infographic that shows the process. The Democrats are fair. All delegates are allocated in proportion. Because Hillary Clinton won in Virginia, her campaign will get more delegates from Virginia than Bernie to the Convention. For example, in CD (congressional district) 8, there is a total of 8 delegates that will be allocated to both campaigns. Clinton would get five delegates, 3 female and 2 male. While Bernie would get 3 delegates, 2 female and 1 male. The delegate share for our community is a total of six (6) delegates from across the state. Not many when you think about it, considering the growth in population. We got six delegates because it has something to do with voter turnout in our community in past elections, which was low. Going forward, we should aim for higher turnout. The more Asians vote democratic year-in-year-out, the more delegates we'll have the next time around. Our vote count as voting bloc. If you decided to run, make sure you file the form for Delegate before its deadline. Check your local democratic committee for deadline. In that form, you will have to make a pledge and support your candidate, either Hillary Clinton or Bernie Sanders. For more information about delegates, check out these sites. For political geeks, check out Virginia DNC member, Frank Leone aka DemRulz, who has a page with tons of information on the convention on his blog. True that there are many ways to go to DNC convention. Suppose you don't want to be a Delegate but you still want to go to Philly and attend the convention, you can either volunteer, do internship, or work for DNC (at the convention).